Justin Gaethje emphatically ended a two-fight losing streak at UFC Lincoln on Saturday, as the UFC lightweight contender scored a stunning one-punch knockout of rival James Vick in the main event. Gaethje needed just under 90 seconds to dispatch Vick, a fighter who came into the bout on a 9-1 UFC record. Known as one of the division’s hardest hitters, Gaethje connected with a left hook just before a vicious right hand evaded Vick’s defenses and sent him sprawling face first to the canvas. Vick was in visible discomfort after the bout as he came to following the knockout. At one point it appeared that he attempted to perform a takedown on Gaethje after the fight as the victor approached Vick to offer commiserations. Gaethje’s win moves his career record to 19-2 and resurrects his status as a top contender in the UFC’s lightweight division. Vick, meanwhile, falls to 13-2. Elsewhere on the card, Michael Johnson won a close split decision against Andre Fili and Mickey Gall got back to winning ways, scoring a rear naked choke win against George Sullivan. OH MY GOD!!! JUSTIN GAETHJE WITH PERHAPS THE KNOCK OUT OF THE YEAR!!! As if MMA Twitter couldn't love Justin Gaethje enough, he delivers a bonkers KO, admits reveling in his opponent's unconsciouness, calls out the boogeyman, and then jokes about fighting the in-cage interviewer. He's built for this. 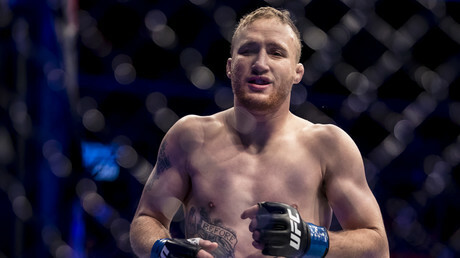 Gaethje made a huge adjustment following two straight losses. In order to not take so much damage, just wipe your opponent out in under two minutes.